So its the day after Valentine's Day, I hope you all had a good day? My Fiancée took me out for dinner which was so yummy, We had Scollops to start, Duck for main and Passionfruit Cheesecake for pudding. I put the pictures up on my Instagram page for you guys to see. I spent a long time debating what to wear and how to have my hair and makeup - I think I was watching YouTube Videos for about a week solid! 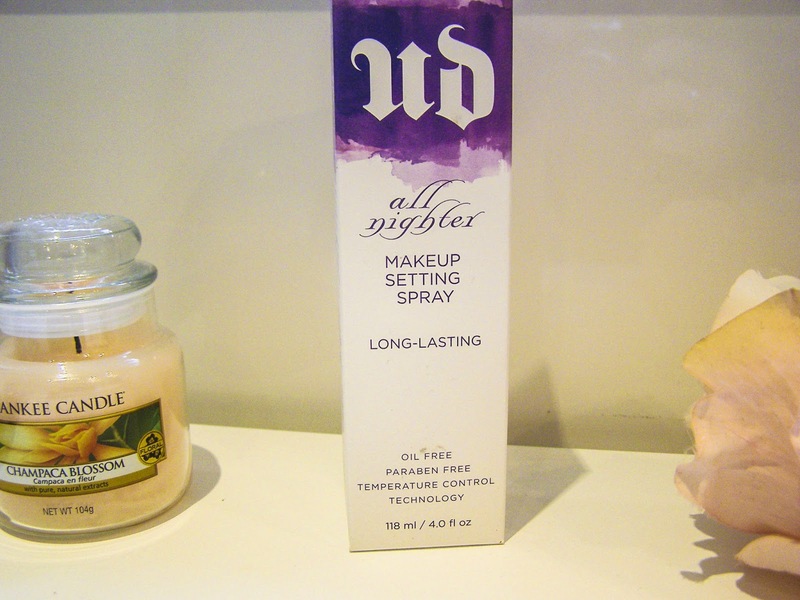 One product I knew I would be using was my Urban Decay All Nighter Setting Spray, The more YouTube videos I watched I noticed quite a few people using it, and mentioned that it did the job and really helped in keeping their makeup in place for a night out. So I knew I would be safe! I applied all my make up for the night which I was taking forever over making sure it all looked right, I nearly got a bit lost with time when putting my makeup on by getting so engrossed with what I was doing... has anyone else had that? Once all was done it was time for the setting spray, I shook the bottle as the instructions said and held it a good distance from my face and sprayed away. Quite a lot comes out in one spray and give quite a lot of coverage so you do not need to spray it that many times. I only sprayed twice and found that plenty to cover my face as you can feel it hitting your face so you can tell where it is settling. I was not sure how my face was going to feel after putting the spray on, I thought I would feel the product on my face after but I didn't feel anything and it just sat on my makeup perfectly. Again I think I would have to say the price, It is a spray so do not think you can charge that much especially when the travel version is only £9. If you are using this on a weekly basis it would start becoming quite costly. It defiantly set my makeup for my night out and my make up did not budge once, normally my eye liner will somehow make its way to my lower lash line sometimes but this did not happen once. I was happy with my makeup at the end of night and looked the same as when I applied it. Hope you guys liked this post, If you have used this All Nighter Setting Spray I would love to hear your comments below. Sounds like it's a product that really does work, but the price tag instantly puts me off, which is a huge shame.